A lovely highland blanco tequila lovingly made and it shows. Tequila Cabeza is part of a portfolio from the newly formed 86 CO. ( Company ) a group of adventurous ( and in some cases obstreperous ) individuals with extremely strong backgrounds in strong drink. Simon Ford formerly of Pernod Ricard, Dushan Zaric and Jason Kosmas of Employees Only a bar the stuff of legends, and Speakeasy Cocktails, an excellent book on Cocktails, are some of the players in this new venture. Rather than become brand ambassadors for someone else’s products ( depressingly commonplace career move/fate for top shelf talent in the drinks industry) they have decided to strike out on their own to bring us the best products they can find, make, or call into being. Their portfolio includes Aylesbury Duck Vodka, Caña Brava Rum, Fords Gin and this the Tequila Cabeza at present. Appearance: Clear sap like appearance with nice legs and droplets on swirling. A nicely heavy look to the tequila itself. Taste: Smooth, oily entry with minerals,black pepper and citrus overlaying a lovely slightly honeyed agave taste. Finish is warming wit the sides of the tongue and midsection getting a hit of black pepper drying with a pleasing minerality. Citrus notes linger and dance on the tip of the tongue along with the grass and aloe notes of agave. You get a unmistakable terrior of highland tequila with the mineral, citrus, herbal grassy notes. A very much alive tequila that captures every nuance of good tequila in a bottle. Very vibrant , aromatic and generally wonderful stuff. Drinks: Excellent enough to enjoy on its own sipped in a decent glass and cheap enough to mix with at least some measure of abandon. In margaritas, sunrises, and palomas it added a lot of nuance and balance, livening the drinks, adding flavors and complexity but not overwhelming the other ingredientsIn other drinks it added its complexity, subtlety and body to smooth edges,blend and make a drink much more than the sum of its parts. Bottle: Clear glass with easy to open foil type screw cap closure. Attractive old style graphics on paper labels make the bottle easy to spot by both customers and bartenders. Interesting graphics on reverse of labels ( look through the tequila) detailing the Virgin Mary appearing in a Pina. Company trademark is embossed on the bottom of the bottle. All the bottles are designed from the ground up optimized for bartenders see http://www.the86co.com/pdf/the86co-Ergonomic-Bottle.pdf for an obsessively detailed guide on features. Feature they do not mention are that the bottle is nicely tall or long with an easy to grip neck making it the bottle to reach for in a bar fight also – or at least they don’t mention that point in the design specifications sheet. 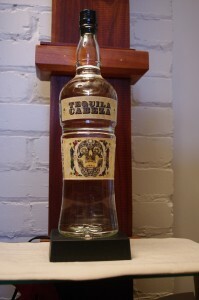 Other: Designed by bartenders and spirits professionals as a bespoke tequila for the trade. People over 30 years old will need magnifying glass and good light to read the back labels. Cigars : Ashton, Rocky Patel or Davidoff, Shade or Natural wrapper, probably a Churchill or maybe even just a Panatela size. Final Thoughts: A nicely detailed, consummate blanco tequila that does not cost a lot of money. Of course given the expertise of the assembled talent of this company I would expect of them nothing less. The company website, straightforward and slightly amusing, easy to navigate. Tequila Cabeza Website , where you can actually read what they printed on those labels and get even more information on this outstanding Tequila. The delightfully obsessive fact sheet that explains why Cabeza Tequila tastes as good as it does.